For all those who live in the Michigan area, I’m going to have a booth at a local craft sale October 31. I’m going to be selling signed copies of Dare. I finally have a newsletter set up! It took a little bit to figure out how to get my free WordPress account to like Mailchimp, but I got it working (I think). 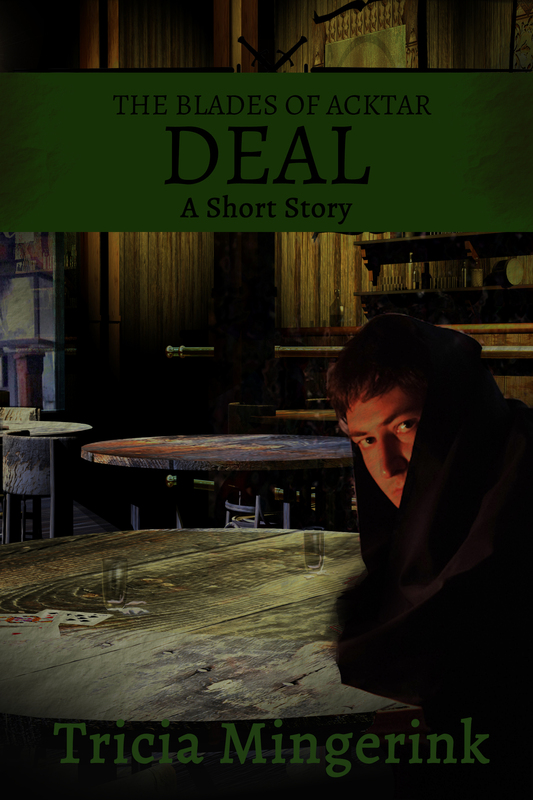 To reward those who sign up, I’ve put together a short story titled Deal. Deal is part of Leith’s backstory. Warning: it isn’t pleasant, but it will answer some questions (and add a few more). The day you’ve all been waiting for has finally arrived (almost). 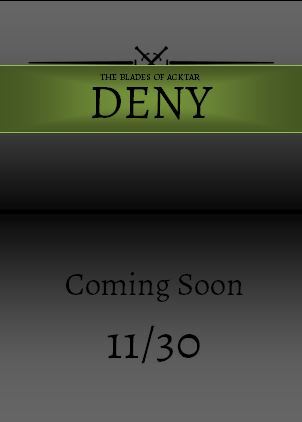 I finally have a release date for Deny (The Blades of Acktar Book 2). It is 11/30! This is just a stand in cover until my wonderful cover designer finishes her awesome cover for this book. If you’re paying attention, you’ll realize that 11/30 is less than two months away. Please keep me in your prayers that the final edits go well. Awesome!! Good luck with all the final editing/cover/etc stuff! And good luck at the fair as well (wish I could be there…)! Hope everything goes well with all the cover, editing, etc. That’s a really good idea! I’ll do that! Ooh, can’t wait to see the new cover!! Me too! My cover designer is still working on it, so even I haven’t seen the final version yet! Yay! I can’t wait to read book two. I loved book 1. November can’t come soon enough. Will Deal become available on Kindle? I have a mobi version of the short story Deal that I can send out, and it does work on Kindle if you email it to your Kindle account. Right now, I’m not planning to sell it by itself. I have a few other ideas for short stories, so I’ll probably bundle them all together eventually and release it that way. Praying editing goes well for you!! Thanks, Shantelle! I hope editing on your book is going well for you too! 🙂 It is very exciting!!! For the Creative Blogger Award tag.